When it comes to assessing the impact of addiction on responsibility, there’s a longstanding debate between two schools of thought. The first, which we might call the “Moral Failing” school, holds that addiction does nothing to lessen responsibility: an addict is someone who exhibits a lack of moral virtue, and so they should not be excused from responsibility. The second, which we might call the “Disease” school, holds that addiction is an action-related disease and, as a consequence, we cannot hold addicts responsible for what they do. Unreasonable Compliance Thesis: An addict is not responsible for violating a norm if in order to comply with that norm they must cede control of their behaviour to something that is independent of their decision-making capacities. Substitution Thesis: In cases where standard norm-compliance would be unreasonable for the addict, there is usually a lesser norm that the addict can be held responsible for violating. The first thesis is so named because Yaffe’s argues that the reasonability of the burdens associated with norm compliance plays a key role in our assessments of responsibility. The naming of the second thesis should apparent. Over the next few blog posts, I want to outline Yaffe’s defence of these two theses. That defence comes in four parts. The first part highlights the importance of reasonable expectations and burden-sharing in assessments of norm-compliance and responsibility. The second part notes how people are sometimes expected to take on the burden of correcting for their defects, and how a failure to meet that burden can lead to the ascription of responsibility. The third part specifies a key condition that makes it unreasonable for an agent to take on the burden of correcting for their defects. And, finally, the fourth part argues that addicts meet that condition. This then leads to the conclusion that the two theses mentioned above are correct. In the remainder of this post, I will focus on the first part of Yaffe’s defence. An argument that is sometimes mooted is that an addict’s responsibility is undermined because they are under duress. 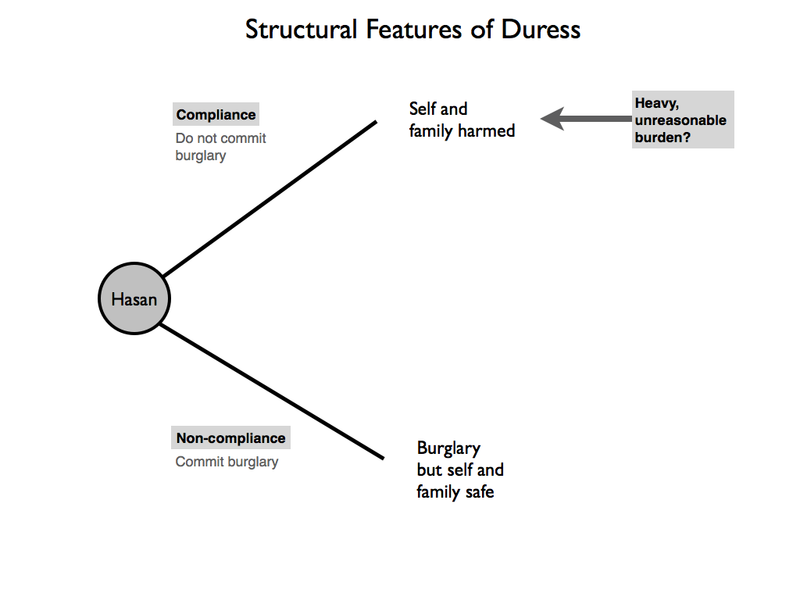 This raises the obvious question: what is duress? Put simply, duress is a defence to a criminal charge. Duress arises when a person is put in a situation in which they are forced to choose between violating a norm (i.e. commit a crime) and doing something that seems to place an unreasonable burden on them. In practice, it is quite difficult to prove, but it is still generally recognised as having the power to excuse. An example will be helpful at this point. In the English case of R v. Hasan (2005) the defendant pleaded duress to a charge of burglary. He alleged that a violent drug dealer had threatened to harm both himself and his family if he did not carry out this burglary. This is a classic example of duress: D, or someone close to D, is threatened with being severely harmed unless D commits a crime. As it happened, the defence was not successful in this case. The court found that D had voluntarily associated with the drug dealer and would reasonably have expected to be threatened or compelled by them at some point. In other words, the court found that if you voluntarily put yourself in a situation in which you are likely to be placed under duress, you cannot avail of the defence. Duress Principle: If D is faced with a choice between norm-compliance and non-compliance, and if there is a heavy, unreasonable burden associated with compliance, they can be excused for failing to comply with the norm. This principle isn’t perfect, by any means. I think it would need to be qualified and refined in a number of ways before it became satisfactory. However, for the time being, let’s assume its accurate and see what follows. 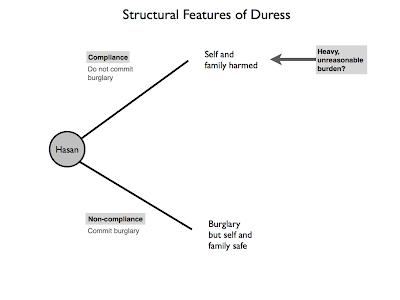 For ease of analysis, the structural elements of duress are represented in the diagram below. The diagram uses the case of R v. Hasan for illustrative purposes, but ignores the issue of voluntary association that arose therein. From the preceding analysis, it would seem that in order for the claim that addicts are under duress to be borne out, we would need to locate some heavy burden that makes norm-compliance unreasonable for them. What might this be? Yaffe considers the suggestion that the burden in question is that of withdrawal. In this context, “withdrawal” is a general term given to a complex of symptoms experienced by addicts once they withdraw from consumption of their preferred substance. If we compare non-addicts to addicts, we find that the latter are (sometimes) faced with a choice between norm-compliance plus withdrawal, and non-compliance, whereas the former are not. For instance, a heroin addict might be forced to steal in order to feed their addiction; they have the option of not-stealing, but if they chose it they would be forced to bear the burden of unpleasant withdrawal symptoms. Non-addicts have no similar burden attaching to compliance. (1) If D is faced with a choice between norm-compliance and non-compliance, and if there is a heavy, unreasonable burden associated with compliance, they can be excused for failing to comply. (2) In some situations, addicts are faced with a choice between: (a) complying with a norm and undergoing withdrawal symptoms; and (b) not complying with a norm and avoiding withdrawal symptoms. (3) Withdrawal symptoms are a heavy, unreasonable burden to bear. (4) Therefore, in some situations, addicts can be excused for failing to comply with norms. Is this a plausible argument? 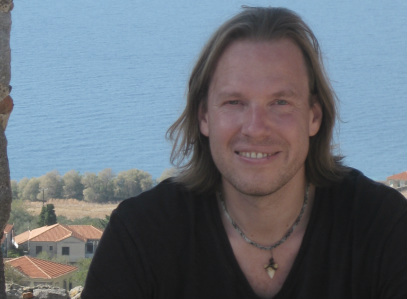 Is an addict really under duress because of the burden of withdrawal? Yaffe detects three flaws in this line of reasoning. The first has to do with the nature of withdrawal symptoms. As Yaffe notes, these vary greatly depending on the substance to which a person is addicted. For instance, a common methamphetamine withdrawal symptom is sleeplessness, while a common cocaine withdrawal symptom is craving. No doubt both are unpleasant, but are they really unreasonable burdens? Would we not expect people to comply with norms even if such unpleasantries were attached to compliance? Furthermore, and this is the angle of attack Yaffe prefers, the variation in symptoms is greater than the variation in beliefs about the responsibility-undermining potential of addiction. In other words, people seem to think that addiction per se undermines responsibility, and they do not seem to pay attention to the specific nature of the withdrawal symptoms associated with different kinds of addiction. Thus, to claim that withdrawal symptoms explain or justify why addiction might undermine responsibility seems wrong. The second problem is that addiction seems to affect responsibility even when an addict violates a norm that has nothing to do with drug use. He gives the example of a heroin addict who has a $30 a day habit, and who calls on family favours to secure himself a job that pays $130 a day (not too shabby for a heroin addict). However, he cannot perform his duties at work competently or efficiently, and he is fired. He has violated a norm (perhaps a social one, but also a legal/contractual one). Yaffe suggests that his addiction surely has some role to play in this, and although we may think he still deserves to be fired, it nevertheless seems to affect the degree to which we hold him responsible for being fired. In this example, addiction plays a part in our responsibility assessments, but that part has nothing to do with the fact that the addict faced a stark choice between non-compliance and withdrawal. Indeed, quite the opposite since the job would have helped him feed his habit. The third problem is that to say that an addict is under duress is a mischaracterisation of how they make decisions. 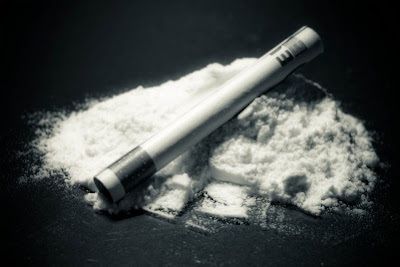 If the addict chooses to violate a norm in order to (say) steal money to feed their addiction, they are not acting so as to avoid withdrawal symptoms. Instead, they are acting because they enjoy, or derive pleasure (or simply need) the drugs, “avoiding withdrawal symptoms” does not really figure among their motivations. This stands in stark contrast to the man who commits a burglary in order to avoid harm to himself or his family. There, the primary motivation for non-compliance comes from the heavy burden of compliance; in the case of the addict, the primary motivation comes the attractive features of non-compliance. There is something Frankfurter-esque in this line of reasoning, and it chimes with certain intuitions and theories we have about what makes someone responsible. Roughly, how they perform an act seems to count for more than what might have happened if they failed to perform the act. If this right, then this duress-based analysis of addiction and responsibility fails. Reasonable expectations and burden-sharing play important roles in how we understand responsibility, but addicts cannot be excused simply because they are under the burden of withdrawal symptoms. If they are to be excused, some other rationale must be sought. We’ll find out more of Yaffe’s thoughts on this rationale in the next post.